Our pinewood derby wheels makes winning as easy as ABC! Fast pinewood derby cars have light wheels. Trim as much weight from your wheels as possible (but keep the wheel balanced) without violating your district's rules. Improve the looks of your wheels by painting the spokes with a silver, white or red marker. It is very easy just rub the marker on the outside of the spokes. Don't spin your wheels too much before the race. Wheels start to wear out after about 20 races. 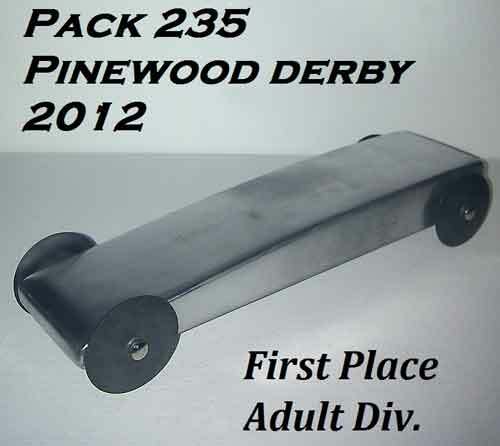 Place the best wheels in the back of your pinewood derby car. Your car is heavier in the back so the rear wheels generate more friction. Some of our wheels are now available in red, orange and yellow. Thise are still official pinewood derby wheels and are the same as our black wheels. Only the color has changed. The wheels that come in your kit have imperfections that prevent your car from going as fast as it could. We offer a variety of prepared wheels with these imperfections removed. Matched Wheels - These wheels all come from the same mold. We also remove the step from the outer hub to reduce friction. Lightly Sanded Wheels - The outside surface (tread) of the wheel is lightly sanded to remove high spots and make the wheel more round. This reduces the tendency of the car to bounce as it goes down the track. The outer hub step is removed. Lathed Wheels - The outside surface of the wheel is smoothed so that the wheel is perfectly round. The shape of the wheel is not altered. The outer hub step is removed. The result is a smooth rolling car with minimum friction. Lite Wheels - The outside surface of the wheel is smoothed and material is removed from the inside of the wheel to make the wheel lighter. A lighter wheel reduces rolling inertia and allows more weight to be added to the rear of the car where it will do the most good. 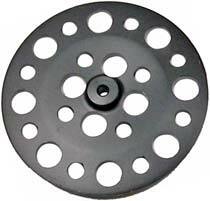 Outlaw Wheels - Thin wheels precision cut to be round and balanced and they are very light. Not legal in most races but these wheels are very fast. Check the details for each wheel to see which are legal in your race. Official BSA wheels and axles that have not been modified. These are for you if you just need a replacement set of wheels and axles for your car. Same dimensions as the official BSA wheels and axles but these high quality components don't require as much preparation as the BSA. Just file the crimp marks off of the axle head and you are all set. May not be legal in official BSA races. Only 1 out of 20 wheels inspected meet our requirements for a Premium Wheel. These wheels are legal in all races! all races - check your rules. All of our speed products now have a "Speed Rating". The number in the red arrow is the number of inches that were gained at the finish line by using this product on our test track. Our test track is only 28 feet long so you can expect a larger gain on typical 32' to 45' tracks. You can use this number to compare the relative speed advantages of our various products. Your local race rules may restrict the kinds of modifications that can be made to your wheels. Here you can select the modifications that are allowed by your rules. The result will be the fastest possible wheels for your race. In general, the more modifications that you select, the faster your car. Pinewood derby wheels are available in four colors. Wheel color does not effect speed. The graphite coating option is only available with black wheels. 16 different molds are used to make pinewood derby wheels. Each mold produces a wheel with slightly different characteristics than wheels created by the other molds. The mold number is stamped on the inside of the wheel. Your car will be faster if it uses wheels from the same mold. Matched wheels are legal in all races that don't restrict the use of matched wheels. The outer hub of the wheel has a step that the head of the axle rides on. This step causes extra friction because the wheel is in contact with the outer part of the axle head where the distance traveled for each rotation is greater. 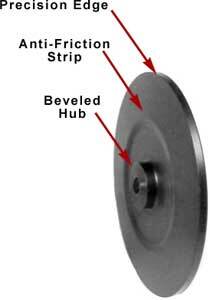 A domed hub moves the contact point to the inside of the axle head, reducing friction. An uneven wheel tread will cause your car to bump as it goes down the track reducing your car's speed. Sanded wheels have only the high areas and rough spots removed. Lathe wheels have the entire tread surface smoothed to make the wheel almost perfectly round and flat. Click here to see if lightly sanded wheels are legal in your race. Click here to see if lathed wheels are legal in your race. A pinewood derby wheel has four areas that create friction. Our special process coats these areas with an even layer of high grade graphite. The graphite is bonded to the wheel so it will last many races. Our tests have shown no reduction in speed after more than 20 races! The areas of the wheel coated with graphite have a dark gray color slightly different than the color of the wheel. Not legal in races that specify that wheels cannot be impregnated with graphite or Graphite cannot be bonded to the wheels. This speed rating shows the number of inches that your car will gain at the finish line for the wheel that you specified. To order different sets of wheels, add the first set into the shopping cart then return to this page to add additional sets. These official pinewood derby wheels have been treated and machined so all dimensions are perfect and ready to race. In addition to all of the modifications of our lathed wheels, the hub is reamed straight and plastic is removed from the inside of these wheels for the most possible weight removal but still retaining durability. These wheels are machined within a .0005” tolerance. Light wheels are faster because less energy is required to spin them. All of the lettering and numbering inside has not been touched so these wheels will meet many Pack, District and Council Rules. This wheel only weighs 1.8 gram. Click here to see if this wheel is legal in your race. 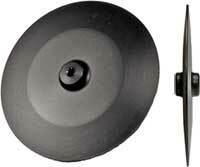 Same as our Inertia Lite wheels but with graphite bonded to the friction areas of the wheel as shown in the picture. Every bit of excess plastic has been removed from this wheel. This wheel only weighs 1 gram. Same as our Ultra Lite wheels but with graphite bonded to the friction areas of the wheel as shown in the picture. is legal in your race. So fast they are illegal in most official races. They are intended for "unlimited", "open division" and other non-official BSA races. These wheels feature our Patent-Pending Anti-Friction Inner Strip, A-Cad engineered design for perfect balance and precision machined from Delrin on a C.N.C. for exacting tolerance. These wheels are ready to run. Just add your choice of lubricant. 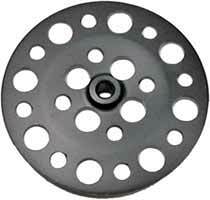 Same as our RS Wheel but with a series of 24 holes precision machined to reduce the weight to .9g. A very fast wheel. These wheels are very similar to the above RS and RSX wheels but they use small .035” diameter needle axles. Set-up and alignment is tricky but you can expect to see up to .0250 sec. increase over the standard “RS” wheels when aligned correctly. We recommend these wheels for experienced builders due to the small axle size and the small drill bits used (you will need to use a drill press to drill the axle holes). Krytox or other liquid lubricants are recommended for these wheels. Due to the small axle diameter, we do not recommend these wheels for cars over 7.5 oz. This is our fastest wheel! Hint: Raise one of the front wheels on your car to make it faster (not legal in some races). Instructions for raising a front wheel. Special formula clings to wheels and axles. 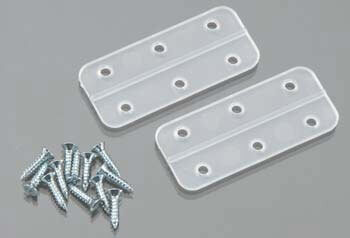 Ideal for Pinewood Derby cars. 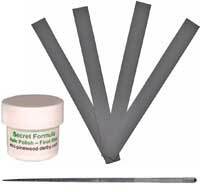 The best pure graphite available. Our axle puller is the easy way to remove axles from your car without damaging the axle or the wheel. Our axle installer makes it easy to install wheels and axles on your Pinewood Derby car the right way every time. Recommend for attaching axles to your car. Keep your axles aligned and secure. the wheel and car body. This video shows how to prepare your pinewood derby wheels. .... and was pack champion, winning 11 of his 12 races. 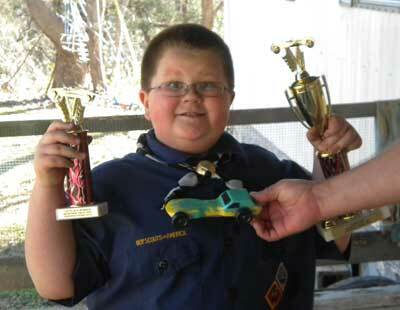 I just wanted thank you for your speedy shipping and great pinewood derby gear. I won the adult division. i highly recommend the thin speed wheels they are great. 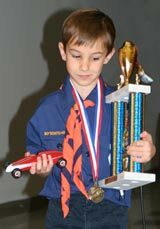 Ryan used our Lathed and Matched Red Wheels and Graphite Coated Grooved Axles to win First Place in his pinewood derby race. Very unusual car design. Just thought I would send yall some info. about the product I ordered. I bought a set of Pro Ultra Lite BSA Wheel's and some graphite covered bsa axles. Everything worked wonderful. I only had one problem which was actually my fault. while putting on the final wheel axle set my hand slipped and dented the wheel and cracked it slightly. Your product is so good though that my son still ended up with first place(den), grand champion(pack), and third overall out of two cub scout packs and one girl scout pack. 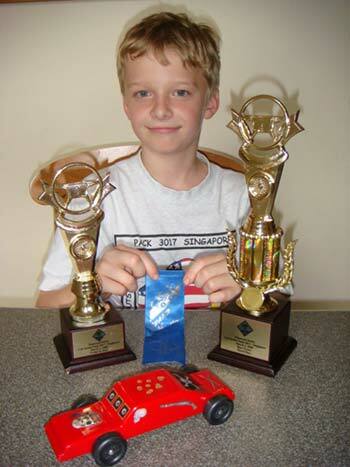 I have enclosed a pic also of him holding his two trophies... Jonathan C.
I used your axles and Wheels and won pack champion. 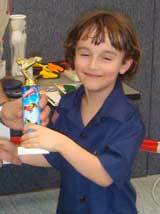 Your products are awsome...David H.
Our daughter got 1st place in the siblings category with top speed of 163 MPH. 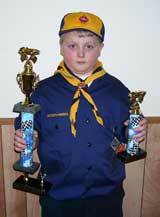 My son got 3rd place in his den with top speed of 167.82 MPH. Thank You...Jorge R.
Your graphite coated wheels are worth the extra cost. The competition was fierce this year and these wheels are what made the difference. We will be back next year...Tom A. The wheels that I got from you are in a lot better shape than if I would have worked on the wheels and that makes the difference needed to win the race....Dave R.
Our son took first place in his den and pack races and in the district championship race, he took first place for all Tigers and third place overall against all packs. 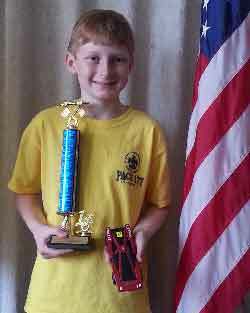 He missed out on second place by exactly 1/100th of a second.....Dan B.
I am very excited to build my pinewood derby car and I can't wait to see what these wheels can do!.....Heather B.
I bought a set of your Inertia Lite wheels and won won won!.....Travis A. 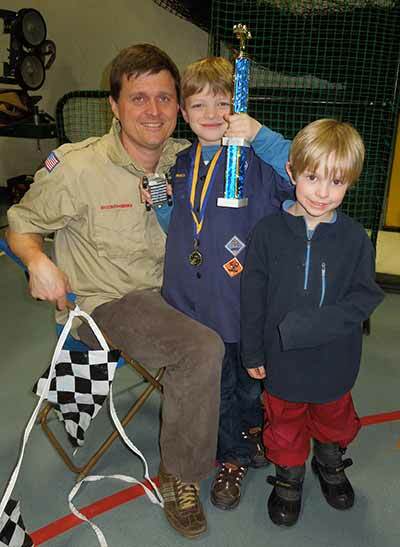 We took first place in our pinewood derby using the rsn-x wheels!! Great product, highly recommended .....Dallas H.